The Indian Navy’s “Act East” initiative begins at Sabang. 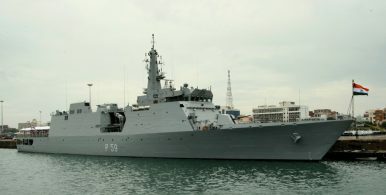 A little more than one month after Indian Prime Minister Narendra Modi visited Indonesia, an Indian naval vessel entered the Indonesian port of Sabang, off the northern tip of Sumatra, astride the northern end of the Malacca Straits. Last Wednesday, INS Sumitra, an Indian Navy Saryu-class patrol vessel, visited Sabang. The visit crystallized India’s growing attention to bolstering its naval presence in Southeast Asia under the Modi government’s “Act East” policy — a recasting of New Delhi’s nearly three decade-old “Look East” policy. At Sabang, the Indian vessel was welcomed by a ceremony involving traditional Indonesian dancers, according to the Business Standard. The Indian ambassador to Indonesia, P.K. Rawat, was also in attendance. In early June, Modi met Indonesian President Joko Widodo. There, he pledged Indian assistance in the development of infrastructure on Sabang. The island notably sits just 90 nautical miles away from the southernmost of India’s own Andaman and Nicobar Islands in the Indian Ocean. As The Diplomat had reported in May, the first signs that India would seriously expand its involvement at Sabang came during a pre-summit trip to India by Indonesia’s coordinating minister for maritime affairs, Luhut Pandjaitan. In New Delhi, Luhut emphasized that Indonesia was seeking ways to turn a verbal agreement between the two countries to have India develop the port turn into reality. Now, weeks after the summit meeting between Modi and Jokowi, New Delhi is making its presence known. One of the outcomes of the Modi-Jokowi summit was a joint decision to set up a task force for the development of the strategic port, which comes at a time of growing anxiety in both Jakarta and New Delhi about China’s own network of port facilities in and around the Indian Ocean region. India, in particular, has long been sensitive to Beijing’s growing network of strategic ports — what many strategists in the country call China’s “string of pearls.” While many of these facilities remain civilian in nature, Indian observers fear that China may be able to easily convert them for military logistics use. China’s sole overseas naval base remains in Djibouti. For Indonesia, a closer relationship with India — a longstanding strategic partner — is opportune. Jakarta maintains a close relationship with China, but the dispute between the two countries over waters north-northeast of Indonesia’s Natuna Islands has intensified in recent years. Indonesia is not a territorial claimant in the South China Sea, but part of its claimed exclusive economic zone overlaps with China’s capacious nine-dash line claim in the region. Both countries’ shared concern about China was apparent during the Modi-Jokowi summit, when the two jointly emphasized the importance of rule of law in the Indo-Pacific region, weeks before the two year anniversary of the July 12, 2016, arbitral tribunal’s ruling in a 2013 case filed by the Philippines against China over the latter’s behavior and claims in the South China Sea. Despite enormous promise, the bilateral relationship remains remarkably quiescent.